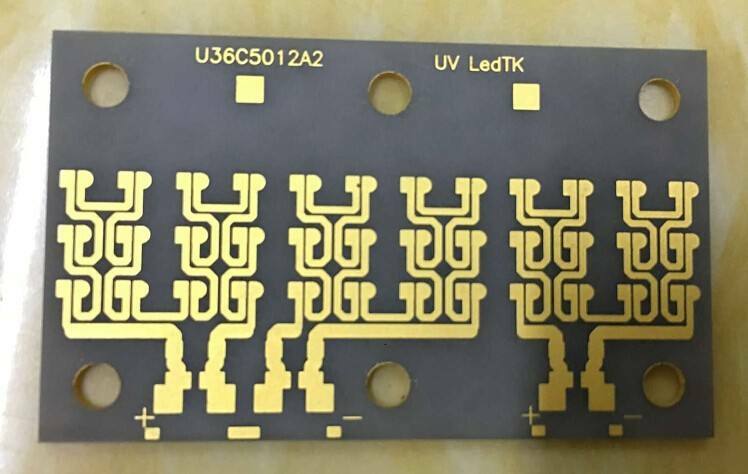 Ceramic PCB includes Alumina PCB and Aluminum Nitride (AlN) PCB. Alumina is the most popular ceramic material for multilayer packages. In constant use and development for years, its performance is well-characterized, with a proven track record. Alumina offers high strength, good thermal conductivity, hermeticity, excellent electrical properties and the lowest cost high density interconnect. Due to its high thermal conductivity and excellent Coefficient of Thermal Expansion (CTE) match to silicon, aluminum nitride is the ceramic material of choice for high heat dissipation and/or large chip applications. Aluminum nitride is produced using hot press technology. Ideal for applications requiring very high thermal conductivity (160W/mK). The patented hot press process allows precision tolerances(±0.15%). Aluminum nitride's primary application is requiring multiple internal metal patterns (30+ layers possible) with vias only terminating on the top and bottom surfaces. The external metal patterns are applied using thin film processing on a precision surface finish having a standard flatness better than .001" / inch. Custom materials can be developed to meet special needs.